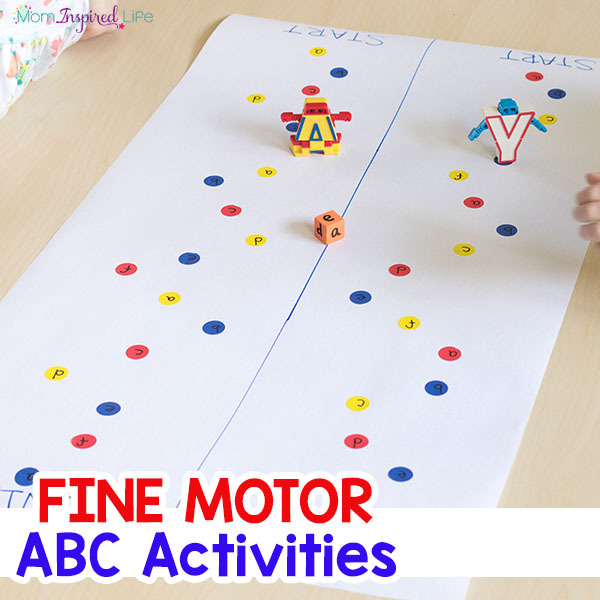 Fine Motor Alphabet Activities for Fun and Learning! Develop fine motor control and teach the alphabet with these playful fine motor alphabet activities. 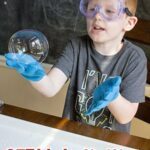 Your kids will ask to do them again and again! As you know, I love teaching the alphabet to my kids in fun and playful ways. 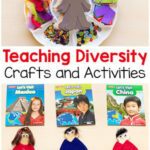 And I love when activities help to develop more than one important skill. 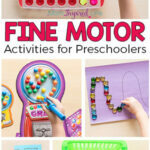 These fine motor alphabet activities do just that. 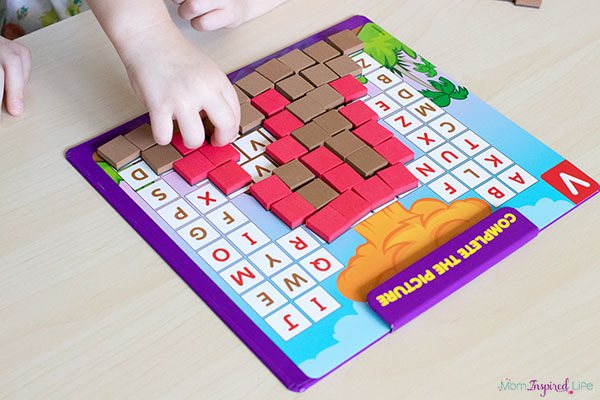 Not only do children learn the alphabet while doing them, but they also develop their fine motor skills. 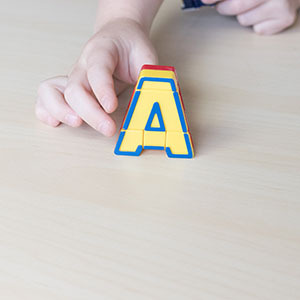 Developing fine motor skills in young children is so important, so I think it’s fantastic that I can develop those skills while teaching my kids the alphabet and letter sounds. The best part is that my kids genuinely loved each activity. They asked to do them over and over again and I was more than happy to oblige! 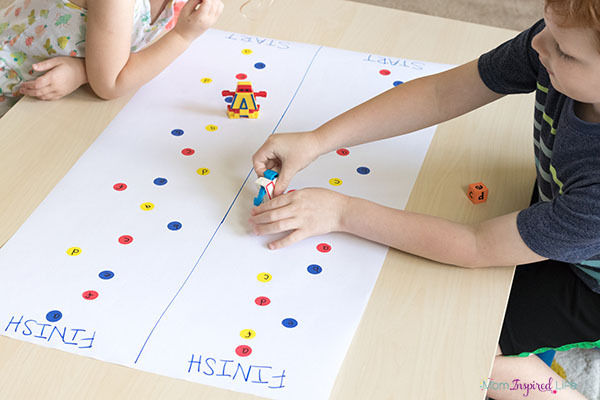 This fine motor alphabet activity is so easy to set up and your kids will absolutely love it! I used Lakeshore Alphabet Rockets to do this beginning sounds alphabet hunt and they were perfect for the activity. Each rocket is split into three parts. The bottom portion has the letter written on it and the top two portions have pictures of objects that begin with that letter. 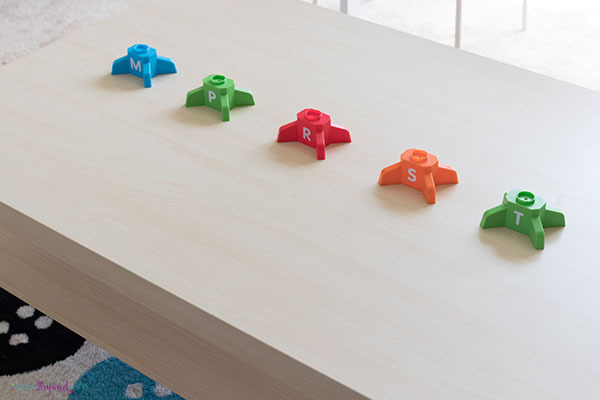 I picked 5 letters I wanted my kids to work on and I placed the bottom portion of each rocket on the table. Then I hid the other two parts of each rocket around the room. Once they were all hidden, the kids went hunting around the room for the rocket pieces. After finding a piece, they would head back to the table and determine which rocket base it belonged to. After they had all the pieces to make a rocket, they would put the rocket together and then continue hunting. They were so excited when they were able to build a complete rocket! After successfully putting together all of the rockets, they immediately asked to do it again. This was a playful way for them to practice recognizing beginning letter sounds in words and matching them to the corresponding letter. While putting the rocket pieces together they were developing fine motor skills too! Learning the Alphabet with Robots! 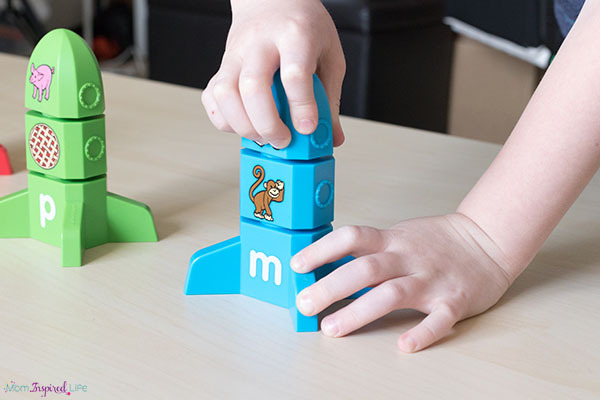 If you want to increase interest in learning the alphabet while also developing fine motor skills, you will definitely want to check out these Alpha-Bots. To say they are fun would be an understatement! My son keeps them in his room, next to his bed because he loves them that much. 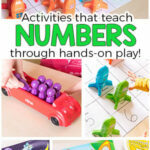 I love them because they not only allow children to explore the alphabet in a fun way, but also do an amazing job at developing those small hand muscles needed to do fine motor tasks. 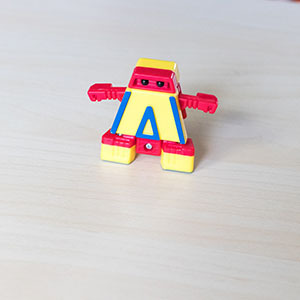 On this particular day, we did a racing robots alphabet activity and it is definitely kid-approved! I started by making alphabet dice. I did this by writing 6 different letters on a small foam cube with a permanent marker – one letter on each side of the cube. Then I cut off a large piece of art paper and drew a line down the middle of it. Next, I put dot stickers on both sides – making sure to put the same amount on each side. I also wrote a letter on each dot sticker that corresponded to one letter on the dice. I repeated these 6 letters on the dot stickers. You can also just draw circles on the paper and write letters in the middle of them. To play, the kids took turns rolling the dice and moving their Alpha-Bot to the next instance of that letter on their side of the game board. The first Alpha-Bot to cross the finish line was the winner! After playing several more times, my son spent some time transforming the Alpha-Bots back and forth from letters to robots and back again. 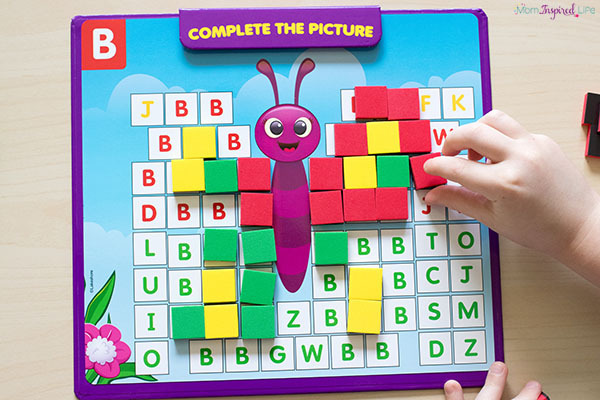 Both of my kids thoroughly enjoyed using Complete-The-Picture Magnetic Letter Match to learn letters while making pictures. They were so excited to reveal the hidden picture! Placing the magnetic tiles on the appropriate spaces on the picture cards was a great fine motor workout for both of them. They loved working together to make the pictures too. 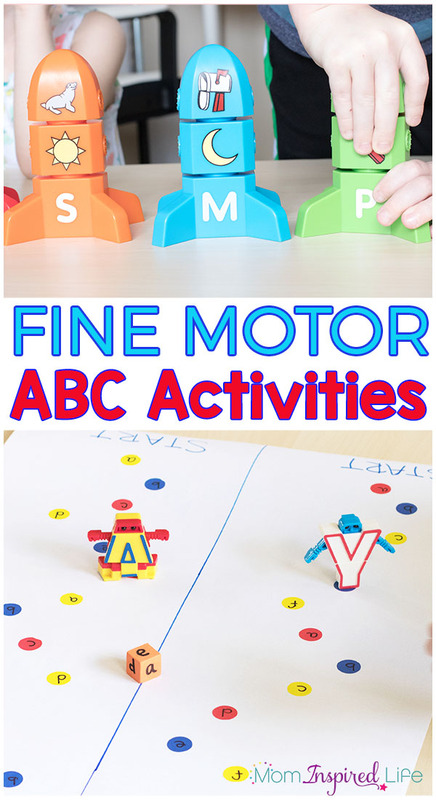 I am thrilled that we now have three new fine motor alphabet activities that I can quickly pull out for the kids to do. I know we will be doing these quite often! Playful Learning is the Best! We love to make learning fun and playful and one of my favorite ways to do that is by getting toys and supplies from Lakeshore Learning. Their toys are always a hit with my kids. They are very well-made and stand up to busy kids. Best of all, my kids never get tired of them. They are always finding new ways to enjoy Lakeshore toys. 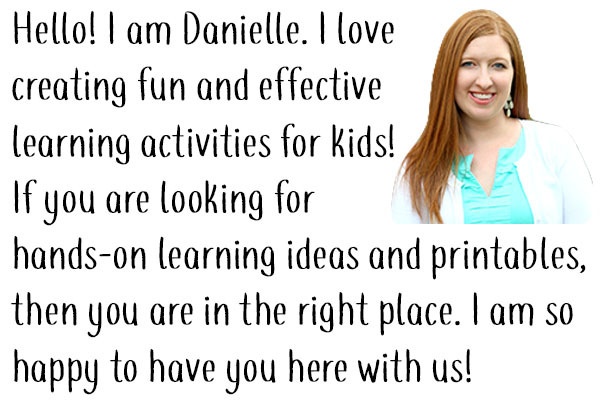 Plus, they are developed by teachers who actually understand child development and the need for play-based learning. 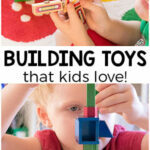 Do you want to pick up some toys so you can do playful alphabet activities with your kids too? Make sure you use this 20% off coupon from Lakeshore Learning! Then come back and let me know what you bought! 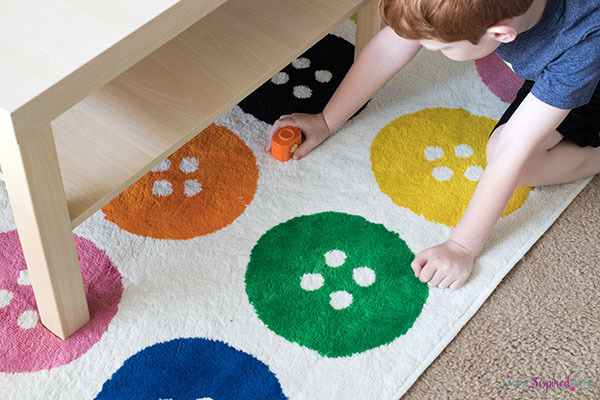 Which alphabet activity do you think your kids would enjoy most?